Travel with Kevin and Ruth! : We made it to the hot and busy city of Merida. 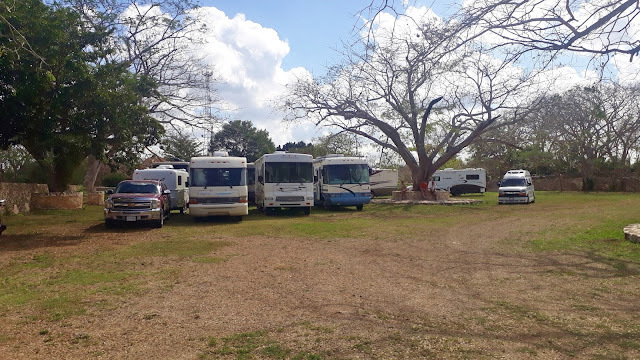 On the road right on schedule for our 9:00am departure for the drive from the Uxmal archaeological site to the northern limits of the city of Merida. Only an 89 km (55 mile) drive, and we planned on stopping half way at the Yaxcopoil Hacienda. The hacienda dates back to the 17th century, and it is privately owned. Seems to be a bit of a work in progress as there is some discrepancy between what the website advertises and what is actually there. For example, the website advertises RV parking with services, but while there is actually a nice RV parking area, there are no services as of yet. Apparently they do plan to have an RV park... some day. Lots of room for all of us to pull in. They want 100 pesos ($6.75 CAD, $5.50 USD) to walk around the hacienda and see the rooms. Five of our group chose to go in and do so. Ruth went in with the camera, while I stayed behind and kept Sherman company. Entrance Gate to Yaxcopoil Hacienda. Not a bad stop, and all five who went in enjoyed it. Probably an hour to an hour and a half to wander around the property. The Rainbow Trailer Park has been here forever. It's exactly as we remember it from when we were here nine years ago. Run down, and dumpy looking. Probably 50 sites with full hookups, but you have to check carefully to find one with all three services (water, 15 amp electric, and sewer) working! Only one other rig here, a big Unimog European style unit. There were a couple of workers here, but I don't think they were doing much until we actually pulled in. Then, they started clearing leaves from some of the sites. One of our units wanted to park where there was dead tree branch sticking out, and the workers went and got their machetes, and the next thing you know half the tree was on the ground! Had to help out some of the group with a few things. Three people needed to see a doctor for various reasons, so I found one of the pharmacies that have a walk in doctors office attached. It was just across the road. One thing about this dumpy trailer park, is the location. It's right beside a big modern Liverpool shopping mall, and next door to that is a Costco. We got the doctor stuff looked after 40 pesos ($2.75 CAD, $2.20 USD) for the first consultation, and 140 pesos (9.50 CAD, $7.75 USD) for the husband and wife pair. A little more detailed as it included an ear cleansing! Then, next door to the pharmacy for some medication. The first patient has high blood pressure and a possible lung infection. We will monitor for the next two days and if necessary will go to a private clinic tomorrow if there is no improvement. Walking back to the RV Park, one of our rigs was heading out to get propane. I hopped in and went with him to make sure he didn't get lost. Then, it was off to the Costco. We don't shop at Costco, but a few of the group have membership cards so we went with them. We didn't need much, and there certainly weren't many deals to be had. Unless you really know your prices, Costco doesn't have much that interests us. We bought a box of beer (that wasn't really a deal, but I needed beer) a block of cheese, a six pack of orange juice, and a tub of almond butter. Made it back from Costco, and there was a package sitting on my chair! Wow! Chocolates! Pretty sure Ruth will help me eat them! A variety of beer! Thanks guys! And I got a nice signed card from the group. What a great birthday in Mexico! 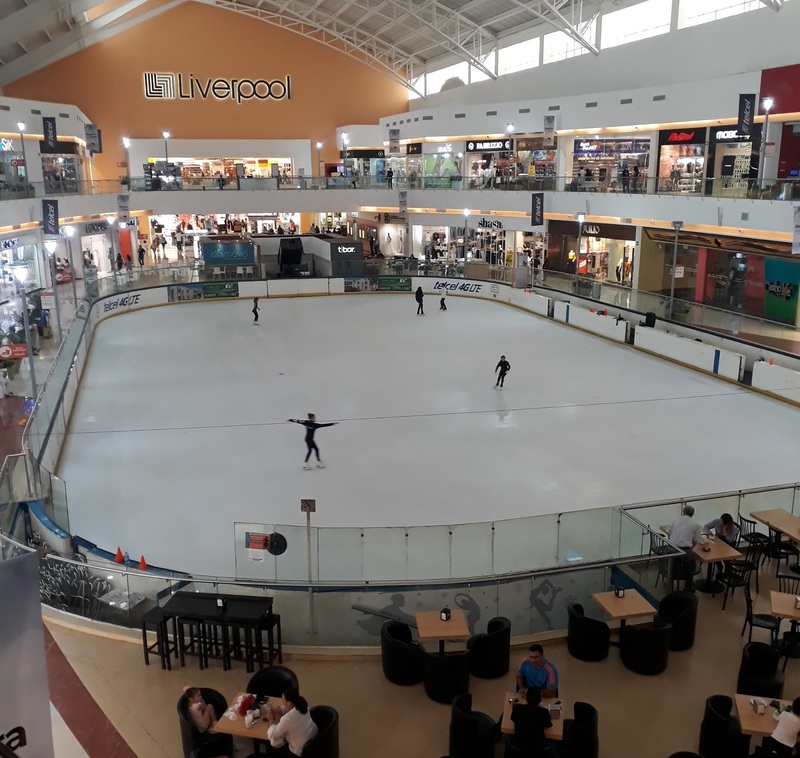 Ice skating at the shopping mall! It's amazing how many people still consider Mexico a "third world" country. I could go on about that... but I gotta stop here. Our tour bus is going to be here in a few minutes to take us to downtown Merida! Yesterday's drive, 89 kms (55 miles). The Ninja Pro Blender is on sale... cheapest I've ever seen it. If you've wanted one, now is the time! Mexico is definitely not a 3rd world country, progressive in so many ways...perhaps some see countries whose backbone is agriculture as a third world country. We personally think that it is people who have never been here that think of Mexico this way. In some ways it is way ahead of both Canada and the States and other ways it is behind but that isn't necessarily a bad thing. Happy birthday! And viva Mexico. Kevin says thank you for the birthday wishes! Kevin, if they need high blood pressure meds you can get them across the counter. Losartan - Hidroclorotiazida, a fairly mild one with a diuretic. High blood pressure form a mexican diet is not unusual. Thank you Paul! I know that one of ones visiting the doctor had his own high blood pressure medication, the other got a prescription or was told what one to buy but we will this in mind. Happy Birthday! 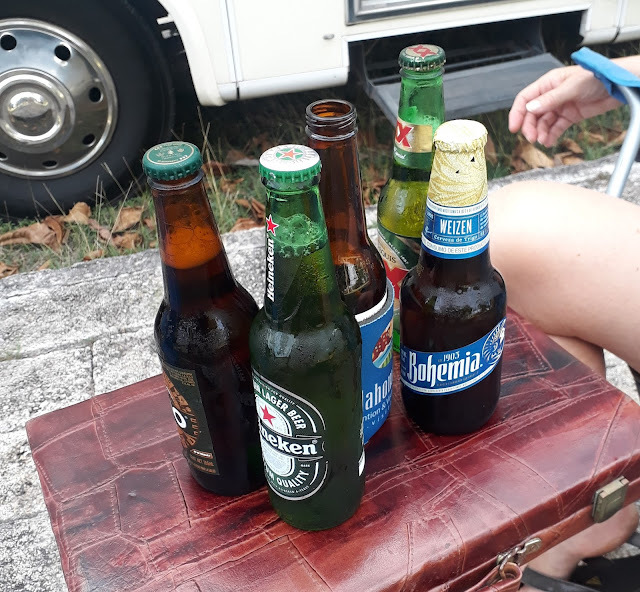 I noticed that one of the beer bottles came with no cap on it! LOL. Kevin says thank you for the birthday wishes. Thank you, we missed it the other day but we saw it yesterday afternoon. They did a beautiful job preserving it and with all the landscaping around it. Also just a note ... the family that owns this park is pretty nice!! Their father built this park 50 years ago!! It was the daughter that came around and collected our money and yes, she was very nice and pleasant and said to contact her if we had any issues. It's just too bad that they don't maintain it a little better, it is a great location. Nice things are back to normal. There was something nasty going on when we were there and we were warned to get a signed receipt or else the other partner might be around to collect as well. The place was deserted when we parked but at 6:30 AM there was pounding on the door and a demand for immediate payment. We had the cash for a week but when we asked for a receipt she just threw a receipt book at us and told us to fill it out ourselves. We did and she signed it. I also took photos as further proof. It was very uncomfortable. That was the last time we saw her but the husband was there every day working on a new entrance gate on the Liverpool side of the property. Word was that she was taking over the house and old entrance gate and was refusing to share any rent she collected with him. Very uncomfortable situation to say the least but like you say, the only place to stay. Yes, it seems that everything is pretty good payment wise now. They do have several big banners up though, telling you to call and say that you are here and it does specifically state to ask for a receipt and to retain it. It also states to only pay authorized persons so I guess they have had many problems like you had, in the past. The floor tiles in the hacienda are amazing. As for Mexico, we have heart transplants, electric cars and charging stations, 800 Starbucks, and for our Canadian friends, Tim Horton's has come to town, 30 million passengers pass through the CDMX airport which is the busiest in the world, and solar, wind and thermal energy abound. The old world has learned to coexist and you will find a horse or two on a busy street next to a mega-mall. You've gotta love Mexico. I sure do! The floor tiles caught my eye right away when I saw them. They are doing a wonderful job on restoring the old hacienda, it really is a beautiful place. Happy birthday, Kevin! A nice way to celebrate a birthday! Wow pretty cool having a birthday with that group. A very happy birthday Kevin. Kevin says thank you for the birthday wishes and yes, he had a good time with the caravan group for his birthday. Happy belated Birthday Kevin. Can't think of a better place to celebrate than with your wife and some friends. Oh and a couple beers can't hurt either. Enjoy. Safe Travels. A big thank you from Kevin! Hope you had a very Happy Birthday Kevin it looks like you were well looked after. Enjoy your gifts. Mexico is really an interesting country definitely not 3rd world. Travel safe! No, Mexico is definitely not a third world country! Well we had more excitement than you this morning here in San Patricio Melaque. An earthquake only 30 km offshore. Pretty violent shaking as it was a shallow one. Always nice when you are camped between the ocean and a Cayman infested lagoon. Ocean went weird, calm for a minute then the surf returned. They are building an addition to the hotel here, never knew Mexican workers could run so fast. Yep, that sounds like a bit of excitement for sure! Glad everything is ok there. We felt the tremors in Valle De Juarez! Just a mild shaking but enough to suspect it must have been an earthquake. Glad to know it was not serious. PS - Enjoying your travelogue - as always! We remember being in Valle a few years ago as well we felt the tremors from an earthquake near Mexico City. Barb and Sal were visiting Mexico City at the time and we were watching the park for them when they still owned it. Glad you are still enjoying our blog. Wow... what a wonderful place. Like those delicate rocking chairs. The hacienda is still a work in progress but so far they are doing an amazing job on it. I hope that they don't fully restore it because I love the old look as well. Happy birthday Kevin! What better place to celebrate a birthday! Have a blast the rest of the year! Thanks for the posts and pictures. Still enjoying following your footsteps! Happy birthday, Kevin! I'm curious - do you know why it's called the Liverpool Mall? It must cost a fortune to operate the ice skating rink, especially in summer. Thank you! It's actually not called the Liverpool Mall. It's the Galerias Merida Mall. However Liverpool department store is the main tenant, so we just call it the Liverpool Mall. Yes, it must cost a fortune to operate the ice rink!